This beautiful elegant African girl is inspired by photos sent by our son (who’s in the Peace Corps) in West Africa. She wears an ensemble of silk and African cotton. 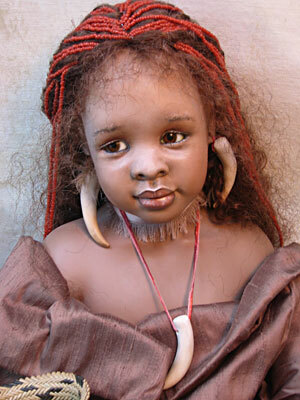 Her hair is heavily beaded and she is decorated with bone & beads. Her head, shoulder plate and limbs are porcelain and she has a cloth body. She is beautiful!